Photo: Caruthers Canyon as seen from New York Mountain Road. Eastern Mojave Vegetation Caruthers Canyon as seen from New York Mountain Road. Caruthers Canyon is underlain by limestone intruded by granite. Granite can be seen intruding the small hill in right foreground. Eastern Mojave Geology -- A Botanist's View: Giant Ledge Mine. Summaries of Literature About the Mid Hills. : Vegetation of Caruthers Canyon. The Vegetation of Lobo Point and North Wild Horse Mesa, Mojave National Preserve, San Bernardino County, California. : Vegetation of Caruthers Canyon. 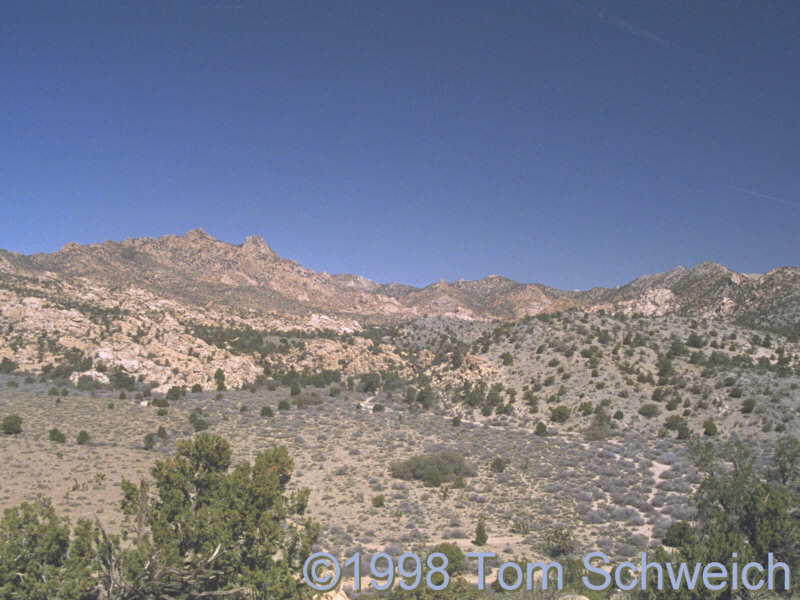 Other photos about Geography - Eastern Mojave or Caruthers Canyon.